Falafel is a very common street food known around the world. It is usually served in a pita bread and sometimes wrapped in a flatbread. Since coming to New York City this has become one of my favorite go to snacks from the street vendors. Sometimes, when all you want to do is just stay home and cool off from the crazy summer heat you can definitely bring home this famous street food flavors to your kitchen with a few simple twists. 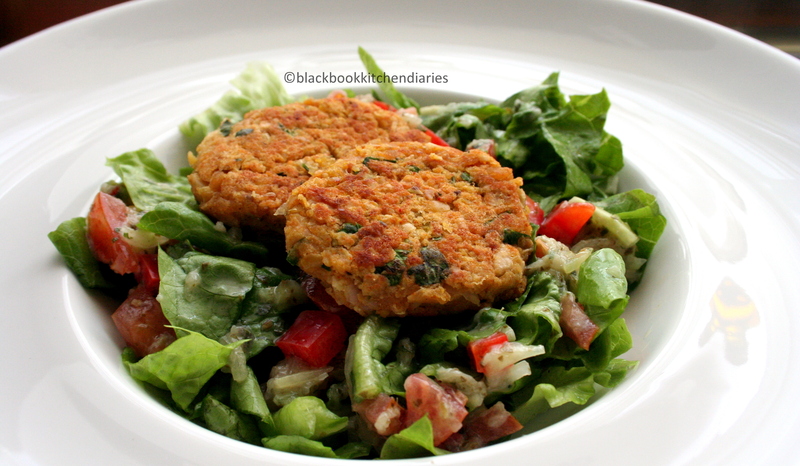 This falafel salad has a nice rich bold flavor to it. There are 3 ways you can do it. You can deep fry the falafel, pan fry it using 2 tablespoons of olive oil or bake it in a 350 degree F oven. Either way it is delicious. I put this together for my dad since he is a big fan of all things chickpea (yes, he is cute like that) Then, I serve this on a bed of fresh romaine lettuce and tomatoes that has been lightly kissed with a tangy olive oil and lemon juice dressing. Using a food processor, mix all of the above ingredients and processed till it is all nicely mixed. Shape the mixture into 1 1/2 inch patties or you can shape then into meatballs. Heat the oil in a deep fryer to 375 degrees F or you may oven bake it at 350 degree F or even shallow fry in a sauté fan using 2 tablespoon of olive oil. Fry or baked until golden brown. You may serve this on a bed of dressed salad. Salad dressing: 3 tablespoon extra virgin olive oil, juice of a lemon, salt and pepper. Looks delicious! 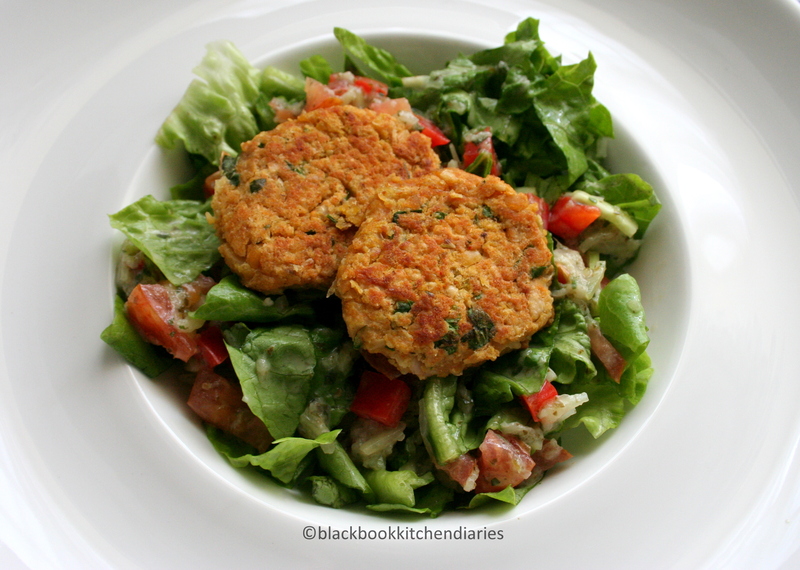 I love falafel…and love making it so I can cut down the fat a little! Love the site. The photography is excellent, and the writing is personal enough to make it interesting. If I had to add my two cents, keeping on making the writing more personal – there are millions of food blogs around, but few that are truly interesting enough to read. You have lovely handwritten recipes; lovely drawings etc – and all this should go on the site as well. And if I were you, why don’t you seriously think about taking orders and baking cakes for people around the area. Put the word out on your site, and see what interest it might generate. Yum! I am going to make this over the weekend.